Clapton’s son, Conor, who he had with model and actress Lori del Santo while still married to Patti Boyd, died at the age of four years old after falling from a window in del Santo’s 53rd floor, New York City apartment. The window was a full wall window that had been removed by a janitor to let fresh air in while he worked. Conor was playing hide and seek with a nanny and running from her when he ran into the room with the open window and straight out of it. Clapton found out when he arrived later to pick up Conor and del Santo to go to the zoo. According to del Santo, during her pregnancy, Clapton attempted to commit suicide by hanging himself, but ultimately just passed out and eventually regained consciousness. 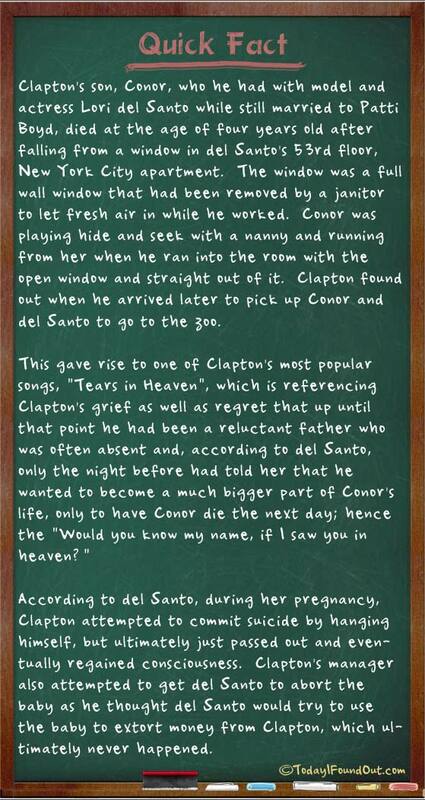 Clapton’s manager also attempted to get del Santo to abort the baby as he thought del Santo would try to use the baby to extort money from Clapton, which ultimately never happened. Things like this wouldn’t happen if more of us paid attention to one another, and cared for each other’s safety, and we’ll being. I’d feel exactly the same if it happened to anyone else in the universe. I hope that janitor was sued as well as imprisoned for negilgant homicide. My heart aches for him as I know what it is like to lose a son. It was a horrible accident. Clapton didn’t blame anyone. Not even the janitor who left the window open. Clapton said the janitor probably didn’t know a child was in the apartment. It’s one of those things where you want to scream WHY?!! Just an unbelievable accident. Pray for Eric and Conor’s mother Lory Del Santo.RIP little Conor. RIP little Conor. You were very loved and missed. Will pray for your parents who are in agony for your lose of life. YES, ERIC. HE WILL KNOW YOU IN HEAVEN. MAYBE HE WILL WANT TO LEARN TO FLY FISH. MAYBE HE HAS WRITTEN A COUPLE OF SONGS FOR HIS DAD. THANK YOU, ERIC, FOR THE MUSIC. I GUESS GRIEF IS FOREVER. BUT, THEN, SO IS MUSIC. I’M GLAD YOU SEEM TO KNOW HOW THE MUSIC HELPS. BECAUSE YOUR MUSIC HELPS ME. I BET HIM TOO.